The easiest way to get to The Star PAC is by the MRT. The Star PAC is next to Buona Vista MRT Station that sits on the East-West and Circle lines. Follow the directional signs that point to The Star Vista and take the covered walkway linking the station to The Star PAC. You'll be able to see the building once you exit the train! Public bus services to The Star PAC include 74, 91, 92, 95, 191, 196, 198 and 200 from bus stops located on North Buona Vista Road, and 105, 106, 147, 185, NR5 and NR 8 from bus stops located on Commonwealth Avenue West. If you are coming from North Buona Vista Road, walk towards Buona Vista MRT Station. Follow the signs to The Star Vista and locate the covered walkway linking the MRT Station to The Star PAC. From Commonwealth Avenue West, follow the pedestrian path towards the Loading/Unloading Bay of The Star PAC. Then turn left to take a flight of stairs up to The Star Vista, Level 2. Turn into Vista Exchange Green from either North Buona Vista Road or Commonwealth Avenue West. The taxi stand is located opposite Rochester Mall. Due to limited parking space at The Star PAC, we encourage you to take public transport. Should you choose to drive, please consider alternative parking spaces near The Star PAC. Located across the road from The Star and a one-minute walk away. Located directly opposite the Buona Vista MRT station. If you park there, you can use the underpass to walk over to the train station and continue on to The Star. Take an approximately 15-minute walk through Buona Vista MRT to The Star. Take the Circle Line at one-north MRT station to Buona Vista MRT station, which is one stop away. 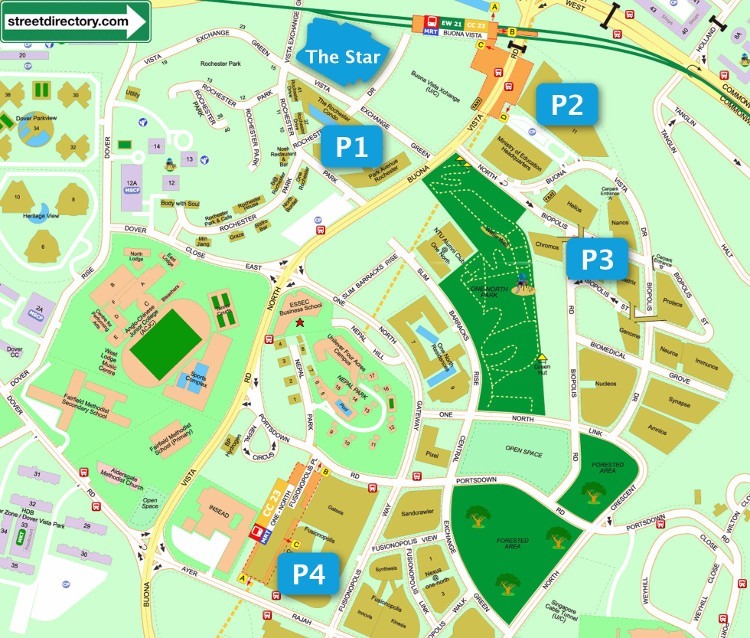 Public car parks are available near Clementi MRT station, around Blk 322/324 Clementi Ave 5 and Blk 442-444 Clementi Ave 3. If you park here, you can take the East-West Line to Buona Vista MRT station, which is two stops away. 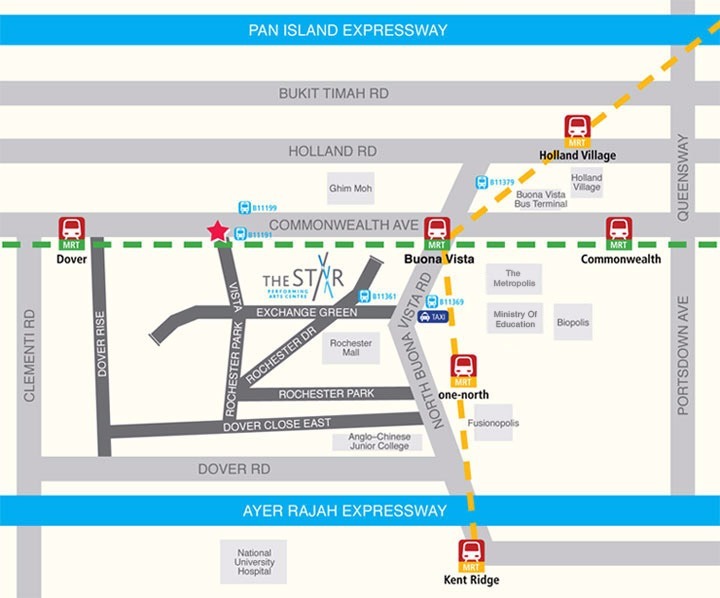 You can reach The Star PAC through the Ayer Rajah Expressway (AYE). If you are coming from Commonwealth Avenue or Commonwealth Avenue West, turn directly into Vista Exchange Green. Enter Vista Exchange Green or Rochester Drive to access the car park. Take the lifts or escalators to Level 2 where the escalators to The Star PAC are located. For information on parking rates, please visit The Star Vista’s website at www.thestarvista.com. This service is available during our Sunday Services and Encounter Nights to local mobile numbers only. To check, simply type “Carpark” and send via SMS to 73333. You will then receive an SMS text with updated information on where car park spaces are available. The time taken to receive the information is subject to the traffic on your service provider’s network. Our NCC app features car park availability check in real time. Simply visit the App Store or Google Play and download it for free.